Reggie Bush, the former American football running back, played in the NFL for 11 seasons until he retired in 2017, playing for Buffalo Bills. 33-year-old Bush, famous for his outstanding career stats with 58 touchdowns, alongside being a fabulous player, is also a father and a husband. Despite his unsuccessful past affairs, Reggie currently seems to be enjoying a sound relationship with his girlfriend-turned-wife Lilit Avagyan. The couple, married for 4 years, shares 3 children together. 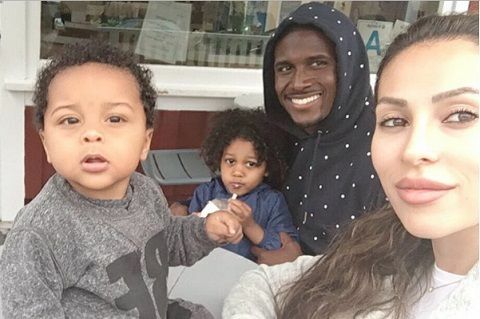 Want to get the details about Reggie Bush's married life, wife, children and past affairs? Stick tight. Unlike his professional career, Bush's love-life had been a rough ride until he met Lilit Avagyan, his now-wife. Reggie Bush's spouse Lilit is an Armenian dancer and choreographer. Ever since their marriage, the couple has not reported any conflicts in their relationship and currently are the parents of 3 children. Sources report that the couple met in late 2011, though the detail of their courtship is yet to be disclosed. Only half a year of their relationship, the NFL player and his dancer spouse, in October 2012, announced their pregnancy. They welcomed their first child, daughter Briseis, on May 6, 2013. Later, a year after the birth of their first child, Reggie and Lilit got married. Shortly after the engagement of Bush and Avagyan in 2014, they surprised all as they married the same year. Well, Reggie Bush, then-Detroit Lions running back and his girlfriend of 3 years married on July 12, 2014. The wedding ceremony was held at the Grand Del Mar hotel in San Diego. In the ceremony, the Los Angeles-based dancer wore a cleavage-baring, mermaid-style gown designed by Galia Lahav, while Bush wore a black and white tux with a bow tie. For a fact, at the time of their marriage, Reggie Bush's age was 29 whereas Lilit Avagyan was 26. As reported, their 14-month-old daughter, Briseis, served as a flower girl. The wedding was attended by 250 guests including many famous celebrities like Cheryl Burke, Stacy Keibler, Joseph Fauria, Sam Martin, and Donte Stallworth. Reggie's former flame Kim Kardashian's step-brother Brody Jenner and his beau Kaitlynn Carter were also the focal-point among the guests. In fact, Jenner took to Instagram to congratulate Bush. Check it out! Congrats @reggiebush !!! #bushwedding ???????????????????????????????????? Since their marriage, Bush and Avagyan are living as husband and wife for over 4 years. With their blissful married life, the duo later welcomed 2 more children, adding to the family of 5. Let's know more. After a year of their marriage, the couple became parents for the second time, as Reggie Bush and Lilit Avagyan welcomed their second child, son Uriah. For a fact, their son Uriah's birth became extra special as it was the couple's first anniversary that day, i.e. July 12, 2015. Previously, before they tied the knot, the celebrity couple shared a daughter Briseis in 2013. Bush and Avagyan welcomed their third child, son Agyemang, on September 2, 2017. For now, the couple has not revealed their plans to have any more children. The happy family can be seen sharing adorable moments together. Both Reggie and Lalit often flaunt their children and their lovely posts on their respective social media. As of January 2019, Reggie has over 622K followers on Instagram while his dancer-wife has over 178K followers. Sources reveal that the family of 5 currently lives in Los Angeles, California. Like we have already mentioned before, Bush has also been through a few unsuccessful relationships. While at USC (University of Southern California), Reggie was reportedly in a secret but short-lived relationship with WWE Diva Eve Torres. Then, Bush started dating reality TV show star Kim Kardashian after they met at the 2007 ESPY Awards, being introduced by Matt Leinart. The former duo was in an on-off relationship. After dating for a few months, the two first split on July 27, 2009, and reconciliation on September 28, 2009, but again broke-up later in 2010. Currently, Kim is married to rapper Kanye West. After that, Bush was in a short-lived affair with Carmen Ortega (August 2009 - May 2010) that followed his alleged datings with Jessie James Decker, Amber Rose, and Melissa Molinaro. Later in late 2011, Reggie met his wife Lilit Avagyan. In November 2016, Bush was rumored to be the father to an unborn child of Monique Exposito, a cosmetologist-turned-Miami nightclub waitress. As per her statement, she got pregnant with the former NFL star Reggie Bush. She also claimed that Bush offered her $3 million for abortion, however, she didn't abort. Then in February 2017, Esposito gave birth to son Preston. Thought, the confirmation of the allegation is yet to be proved. Is Reggie Bush on an NFL team? As of January 2019, Bush is not in any NFL team since his retirement in 2017.
Who is Reggie Bush married to? Reggie Bush is married to his dancer wife Lilit Avagyan. When and Where did Reggie Bush Marry? Bush married on July 12, 2014at the Grand Del Mar hotel in San Diego. How many children does Reggie Bush have? Reggie Bush has 3 children together with his wife Lilit. Did Reggie Bush date Kim Kardashian? Yes, Reggie and Kim were in an on-off relationship from 2007 to 2010.